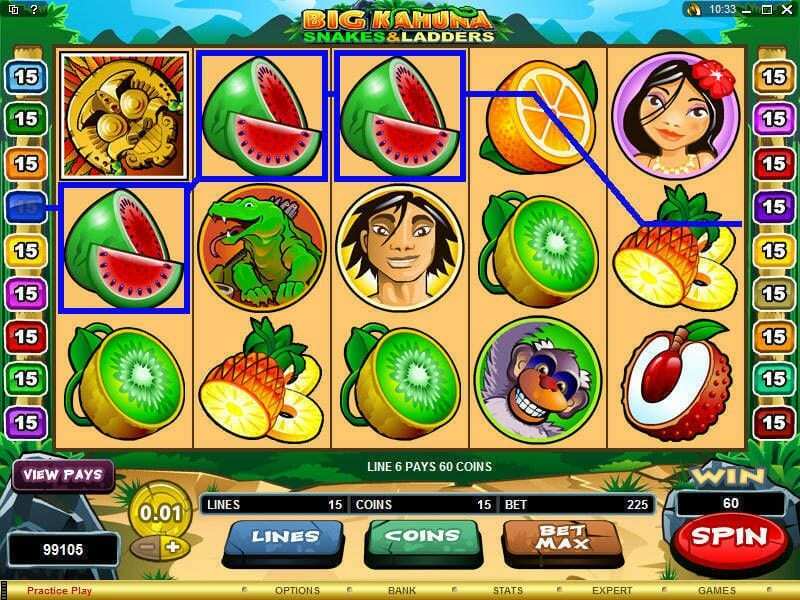 Here's the latest game in the Big Kahuna series, Microgaming's new game Big Kahuna Snakes and Ladders try these online slots at Wizard Slots. Launching in 1994, this Isle of Man-based developer was the first of its kind. Starting at the top, the past two decades have seen Microgaming rise and evolve with the industry. Now holding over 850 unique casino-games their monthly releases are continuing to keep their portfolio new and fresh, bringing in new players from the worldwide slots market each and every day. Despite receiving multiple awards for their contribution to the gaming community Microgaming remain humble, taking pride in the quality of their content and the entertainment they bring on a global scale rather than the number of awards under their belt. So go ahead and deposit £10 on slots games today. Join the Big Kahuna ones more in his latest adventure – Big Kahuna Snakes and Ladders (BKS&L). In the style of a 5-reel 15 payline video slot, experience a hybrid of your favourite childhood board game and the ever-delightful Hawaiian tropics. For an updated list of games based on their themes, click here. Within the game the BKS&L logo acts as a Wild symbol, this can be used as a substitute for any regular symbol to form a winning payline, but in this game the Big Kahuna has a twist. Players will spot the BKS&L logo when activated due to the flashing, attention grabbing animations. Once this has completed a x2 multiplier will be attached to the base game win – giving players twice the prize just for using the Wild card. When this animation triggers during a Free Spin round, the symbol gets even wilder, resulting in a x4 multiplier but the fun doesn’t stop there. Any players who manage to line up x5 BKS&L logos on a single payline will find themselves with a payout value amounting 5,000 coins. Unlike within many slots of a similar level, the Free Spin round is triggered at random, each randomly triggered Free Spin round will gift players 5 spins. During this time, all payline wins using the base symbols are doubled – additional to this, as mentioned previously, during these rounds any Free Spins that make use of the Wild will gain a x4 multiplier. Some of the more iconic features behind BKS&L lay in the Bonus game. To trigger this bonus, players must find the animated Snake symbol on reels 1, 3 and 5. The game will then take on the same mechanics as a traditional Snakes and Ladders board game leaving players to throw 5 virtual dice to determine how many places they can advance. Landing on a ladder allows players to move up to the top of the ladder. Just like the board game, the snakes will take players down to a lower level, setting them further back – possibly even to the starting point. The intensity of the game builds as the player races against the machine in an attempt to win the much sought after 100x bet-value multiplier. If players feel like they might lose the Snakes and Ladders bonus the game also offers a Collect option, granting players the choice to leave and take their current winning amount away with them. Snakes and Ladders is a game many people can relate too, the addition of playing for money appeals more to my adult side than the board game ever has. The anticipation and potential winning of x100 is an incredible combination. Besides the iconic Snakes and Ladder addition, this game is filled with stunning graphics work and a range of traditional bonuses with Big Kahuna twists. Having Free Spins randomly triggered rather than using a Scatter helps to keep up morale as even with a losing spin there is still a chance for a bonus trigger. Big Kahuna 2 is just as entertaining if not more entertaining than its predecessor.